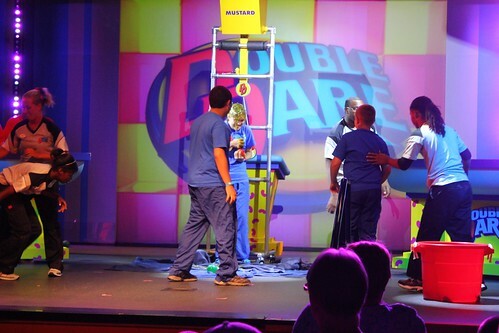 Guests staying at the Nickelodeon Suites Resort in Orlando, Florida this summer are about to get super sloppy as the classic kids’ game show “Double Dare” has returned in a new stage show. 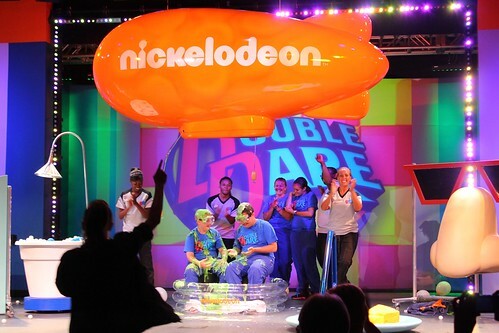 Double Dare Live is performed daily in Nick Hotel’s Studio Nick, featuring all the gak-packed action from the former Marc Summers-hosted TV show. While this version of “Double Dare” isn’t televised, it does have the feel of a real production and plays out just like the memorable program did years ago on Nickelodeon. 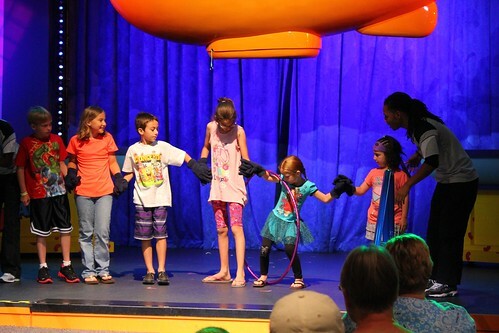 Anyone who grew up envying the kids who got to run the “slopstacle course” will grin from ear-to-ear upon hearing the new live show begin with those simple but iconic words: On your mark, get set, go! 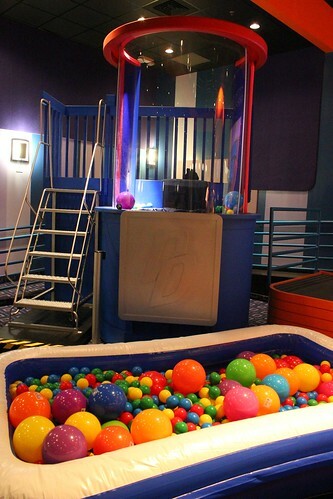 Double Dare Live is available exclusively for guests with reservations at Nick Hotel. 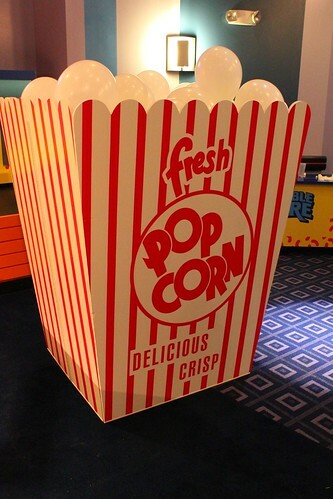 It’s easy to be in the audience, simply requesting a free ticket with guest services. But those who want to be one of the lucky 8 to participate in the show will need to gather in a team of 4 and submit names, ages, and a funny story to the hotel for casting. Then in a grand ceremony midday, the chosen teams for the day are announced. Those not chosen for the show who still want a chance to run the famous obstacle course can do so for an additional fee outside of advertised show times. 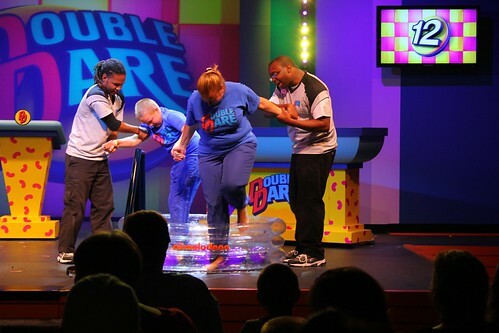 While attending Double Dare Live is free, the price to book a trip through the course is $350 for up to a group of 4. 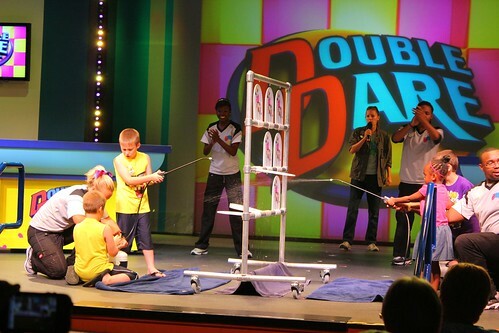 That cost includes a 5×7 photo, Double Dare T-shirts for group – and win or lose, everyone gets slimed. 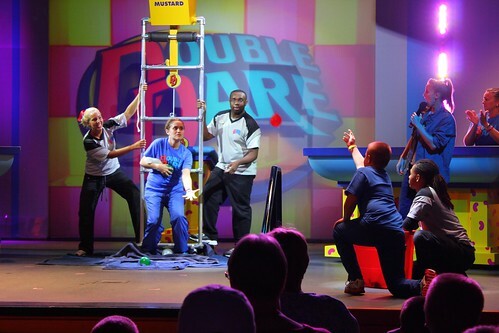 The whole experience closely matches that of the original “Double Dare” show, but with some new twists and quite a few nostalgic throwbacks. 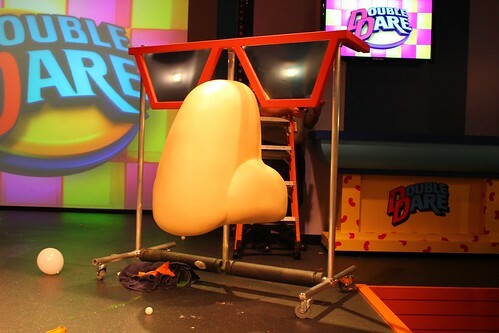 As guests enter Studio Nick, it instantly becomes obvious that this is not an all-new incarnation of “Double Dare,” or even the short-lived “Double Dare 2000,” but a return of the original from the late ’80s and early ’90s. With bright yellow and orange colors, the design of the set is unmistakably accurate. But it’s not only the pre-selected hotel guests who get to participate, as a warm-up host first pulls a few kids from the crowd to take part in a less sloppy physical challenge or two before the show begins. 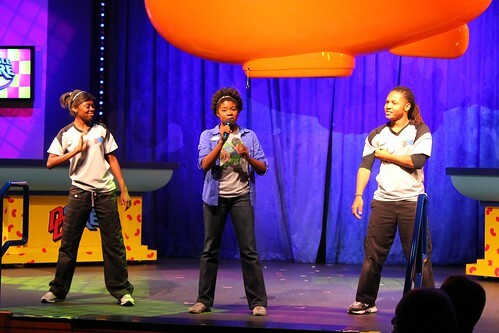 Then as those famous words ring out and the show’s host exclaims “GO!”, the audience is instantly transported to classic Nickelodeon as the stage lights up, familiar music thumps, and the first challenge begins, again using audience members. 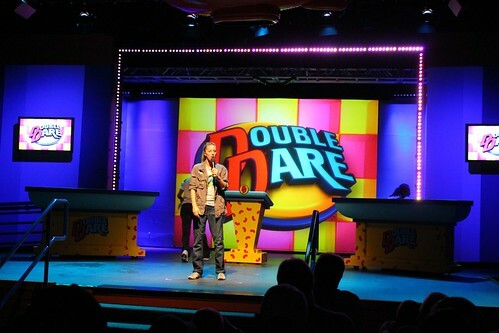 Nick Hotel has a few seasoned hosts to fill Marc Summers’ shoes in hosting Double Dare Live. Fortunately, they don’t try to imitate or impersonate him, instead putting their own spin on the hosting duties. It’s a bit jarring at first to see a female host, but as everything flows just as smoothly as on the TV show, Summers’ absence is forgotten and the show that unfolds is simply entertaining. Almost everyone knows the rules of “Double Dare” but they’re explained simply anyway. Teams are given a trivia question to answer for points. If they’re unable to answer they can dare the other team, who subsequently can double dare the question back, at which point the original team can either answer for more points or take a physical challenge. 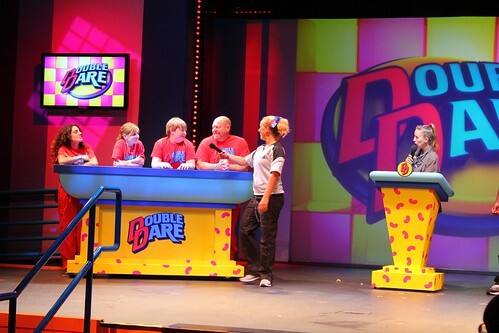 As seen in the video highlights above, a retro look at “Double Dare” of the past is offered during the trivia rounds via a clip of Marc Summers reading a question from the original show, which the teams have to answer. It’s a fantastic way of tying the new stage show in to the past. Trivia proves to be just as amusing as the sloppy challenges as seemingly easy questions like “How many eyes does a Florida panther have?” inexplicably get dared back and forth. Perhaps it’s the pressure under the bright stage lights. 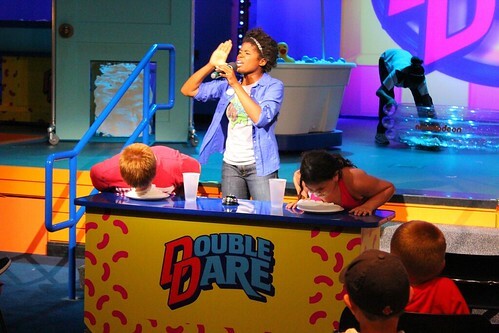 Nevertheless, it is the physical challenges that everyone remembers about “Double Dare” and the stage show offers the chance for contestants to get messy while winning points. In the end, as the blue team dominated this particular game and claimed victory, the red team didn’t go away empty-handed, given the opportunity to reluctantly splat themselves in the face with pies as a parting gift. No prizes are awarded in Double Dare Live, so this is the next best thing for those losing team. 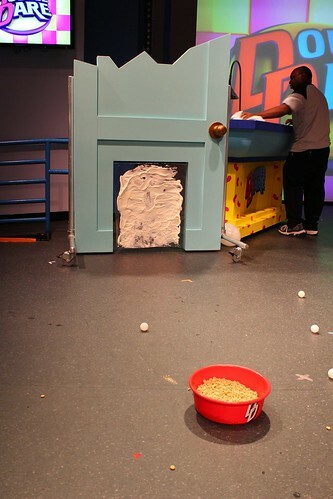 As the stage is prepared for the winning team to run the famous slopstacle course, the warm-up host returns to offer a couple more kids in the audience a chance to get messy, diving their heads into plates of whipped cream in search of… well, does it really matter? 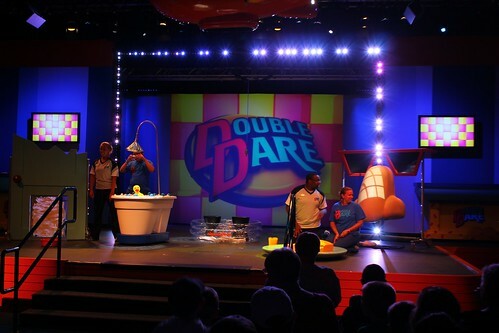 All the while, famous obstacles recreated from the original “Double Dare” show are wheeled out on stage. and the gum ball machine, among others. 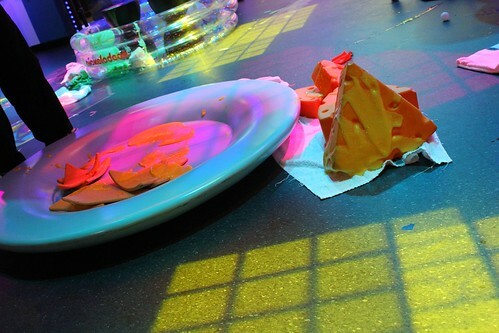 With 60 seconds on the clock, contestants must race through all eight obstacles, diving, jumping, and feelin their way around all kinds of gak to retrieve a flag in a relay race to the finish. 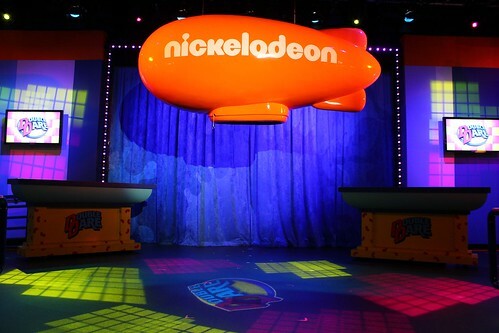 And the prize for success is a big green sliming that pours down from the iconic Nickelodeon orange blimp overhead. It’s an exciting finale to Double Dare Live much as it was at the end of each episode of “Double Dare” decades ago. Nick Hotel’s new stage show is must-see for anyone who was a big fan of the original TV game show and will bring back a flood of happy memories of coming home after school and plopping down in front of the tube watching nothing but Nickelodeon for hours on end. 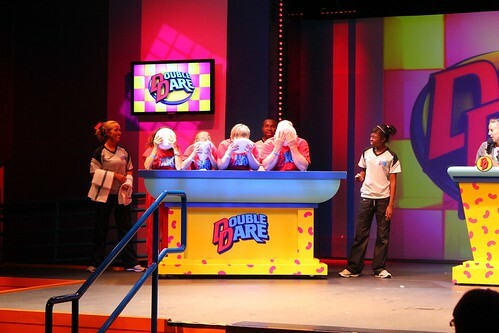 For new generations too young to remember the original, Double Dare Live will be just as entertaining and fun as it was for those who once wished to be on it. 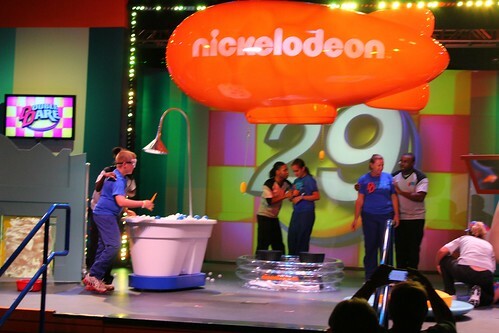 And as “Double Dare” was once taped in Orlando just down the road at Universal Studios, its new live home at the Nickelodeon Suites Resort is a perfect place for it to make a triumphant return. What was the name of a similar show…where they had to race around through various rooms that were decorated like a pirate ship, an Egyptian tomb, a messy room, etc. It had all the gross stuff they had to search through, but I can’t think of what it was called. To above: Were you thinking of Finders Keepers? FINDERS KEEPERS! That’s it! Thanks so much! I found it on YouTube now. Your thinking of Fun House I believe….